Since it is Halloween in just a few short days, it is only appropriate that I found some wines that are just wickedly perfect for the scariest day of the year. 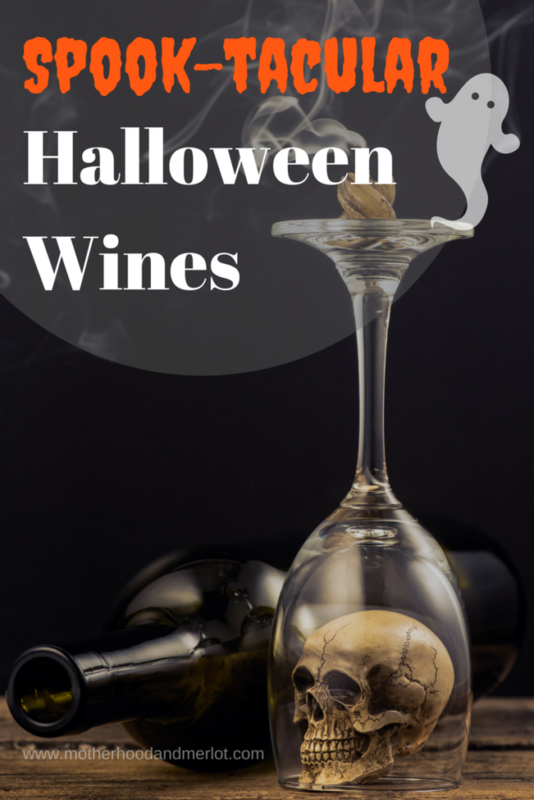 These wines for Halloween aren’t made for this holiday specifically (at least not that I know of), however their names, labels and some of their flavors fit right in with the spooky, creepy, scary, and horrific nature that October 31st brings each year. I update these holiday wine lists each year with new wines that I find during every new holiday season. This one is new for the 2017 update of this post, and how amazing is the packaging? Honestly, I just could pass it up. I picked this up for$11.99 at World Market (on sale!). Tasting Notes: The traditional notes of cherry and a touch of raspberry, in combination with an interesting flavor of banana. There is a a hint of smoky flavor on the finish, combined with a sweetness of black cherry. For the packing, price, and profile, I would give this wine a 3 out of 5. I wasn’t a huge fan of the banana in the wine, but am a sucker for packaging. Tasting Notes: At first, this wine gives off a slightly spicy and intense flavor. After letting the palette get used o the flavors, you can pick up raspberry, a hint of chocolate, and a peppery finish that really balances this wine out. This was by far my favorite out of the four new wines I picked up this year (2016, pictured above). I would give this wine a 4.5 out of 5. It was unique and the palette kept me interested. Bouquet: Red berries with spice. It smells rich and “fiery” from the get-go. Tasting Notes: Really spicy for a wine. There is sweetness from the maple notes, but an overall level of spice from being aged in whiskey barrels. I would give this a 2.5 out of 5. While it is an interesting glass to sip on, I couldn’t drink more than a glass in one sitting. However, my husband and his brother really liked it, and would give it a 3.9 out of 5. Tasting Notes: Heavy on the berry. I wouldn’t normally say this, but you can taste the actually grapes in this wine. You can really taste the notes of spice and a slight earthy flavor on the finish. I would give this wine a 3 out 5. it wasn’t terrible, but it isn’t something I would reach for. Tasting Notes: This wine is a little bit different from the others in that it is a wine cocktail. It is extremely sweet, and slightly carbonated. The recommendation is to drink this wine chilled, and I would total agree with that. I would give this a 3 out of 5, but only when you are in the mood for this specific type of wine. I wouldn’t reach for it regularly, and I have a feeling it’s more of a specific occasion (wine and cheese party) wine rather than an everyday bottle. Bouquet:: Right away you get an overwhelming and rich berry smell combined with a slight whiff of cherry. It smells like some wonderful dessert. Tasting Notes: Raspberries, blackberries and cherries combine to bring sweet notes at first taste. There is also a mild currant flavor that gives the wine a smooth flavor in the beginning. The end is where it gets quite intense. Sweet with a powerful spicy finish that lingers on your palate for a good while after that sip is finished. Personally, I was not a huge fan of this wine. The finish was a bit strong for me, and I really love wine that has some spice to it. Something about the flavors did not combine well on my palate, however it is not a terrible wine. I would say that it has quite a “vicious” combination of flavors that fits well with the intensity of the Halloween holiday. Priced at around $9. I would give this a 2 out of 5. This 2013 limited release red from California is one that you will not want to miss! At around $9, it is an absolute winner. Tasting Notes: This wine is one of the smoothest wines I have ever had the pleasure of tasting. With flavors of berries combined with the sweet bite of dark chocolate, this wine is absolutely delicious. It is so good, the amount of it you will want to drink may scare you. This frightfully delicious wine is totally Halloween appropriate! I would give this a 4.9 out of 5! Highly recommend for you all to go hunt this down at a World Market. Bouquet: Spicy plum and cranberries in combination. To me, it is extremely reminiscent of a fruity body spray. Tasting Notes: as soon as it hits the palate, you get a strong flavor of overly ripe plum and black cherry. The finish has is a mixture of strawberries, peppercorn and vanilla. This wine was interesting. The tag line is “the wine to die for”. I would beg to differ. While I do think it has a really unique flavor profile, I wouldn’t give my life for a bottle of this. It was around $11 on sale, with the larger bottle being around $23. It was recommended to me as one of the most popular sellers. Because of that, I would say try it for the experience and the fact that the bottle alone would look great on your creepy dining room table. I would give this a 3 out of 5. What better wine to end with then this… you may wonder how this fits with Halloween. I for one am sure to lock my dead bolt and check it a few extra times after visit some of the scary sites and seeing some of the terrifying costumes that people jump out of the shadows (literally) with each year. An example: after my recent visit to the haunted house for the very first time when I was chased by someone with a chainsaw out of the haunted house… never again. Bouquet: Luscious red fruits and berries. This is the kind of wine that you can get sucked into based off of the scent and the very first sip. Tasting Notes: A really strong fruit flavor combined with an extremely light bit of oak. There are also plenty of rich black cherry notes, a balanced amount of spice and a wonderful addition of mocha into the mix. Talk about a winning combination. Thankfully, this wine was much better than my trip to the haunted house. I really enjoyed the flavors of it and the fact that it was really smooth. I would dare to call it “wickedly delicious”. Priced at around $13. I would give this a 4 out of 5. Ghosts… Halloween… they kind of go hand-in-hand don’t they? Bouquet: This has one of the most unusual scent profiles out of any of the wines I have sampled (which is quite a lot)… but not in a bad way. It gives off a creamy coconut scent combined with a hint of spices and berries. Tasting Notes: Vanilla, coconut, maybe some cinnamon as well. The vanilla flavor is fairly strong and the beginning and middle of this wine is pretty decent. It’s the finish that really wasn’t my cup of tea. It leaves you with a lasting taste of bitter spices which, on my palate, were much to in-your-face. I found myself only being able to finish one glass of this before moving back to the Once Upon A Vine I sampled before it. I was surprised, seeing as this was around $18, I expected more from it. I would give this a 3 out of 5. I won’t lie, I was suckered in by the bottle on this one. “Once Upon A Time” is one of my favorite fall shows that airs during this time and this brand just reminds me of it perfectly! It has a big bad wolf creeping around a tree for goodness sake…Not to mention the name itself. What can be more fall/Halloween themed then that? Tasting Notes: You get a lot of deep plum flavors, mixed in with the dark berries that accompany the scent. There are some rich flavors of dark fruits and spices and you continue to enjoy the glass. It has a nice, smooth finish that makes you want to take another sip. This wine is super smooth and easy to drink, like a lot of good red blend’s tend to be. I would give it a 4 out of 5. I am a huge fan of red wine in general, but reds that have rich, dark flavors like this tend to be some of my favorites. 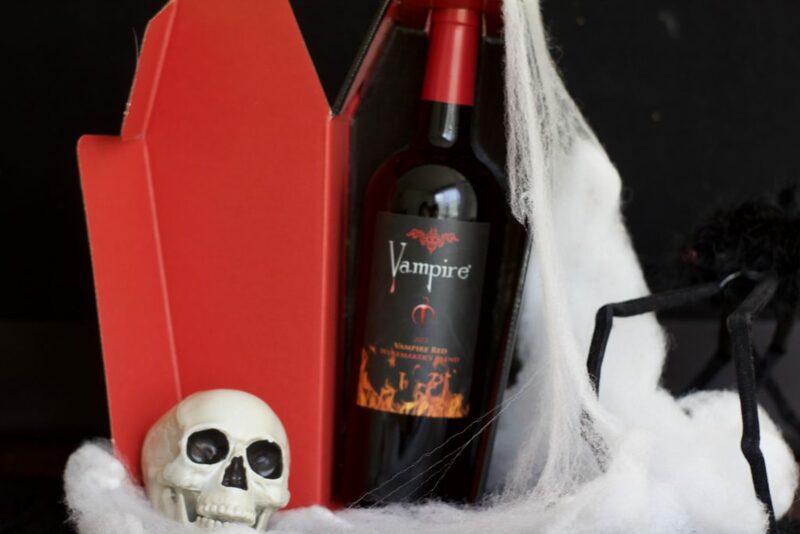 Dress up as a your favorite risqué character and connect with your inner dark side as you drink this wine on Halloween. For around $10, you won’t be disappointed. Have you seen any other fun wines for Halloween around that I need to try? Why am I always thirsty when I visit your blog? Sheesh! I can’t wait to try these! The bottles themselves will be worth it, as I have a tendency to keep interesting bottles after we’ve finished them. They would all go great with the collection! How cool to find some the perfect themed wines! Happy Sipping & Halloween! Poizin Zin!!!! Love Zin…when I drink wine, and I LOVE the label!! Any of these would be great to bring to a Halloween party. Wow! 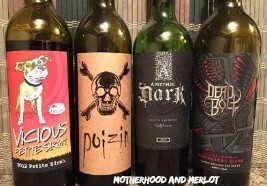 These are great wines for halloween! Thanks for sharing. Taking Halloween to a whole new grown-up level. Love it–thanks! Well now I’m pretty thirsty! I have had good experiences with the Apothic line of wines when it comes to price that doesn’t hurt my pocket book and an overall pleasing quality in taste. The original Apothem red blend has always been a favorite of mine. The “Once Upon a Vine” and “Rest in Peace” blends sounded delicious. I’ve never even considered Halloween-themed wines before! I really enjoyed the Rest in Peace especially! What!! I had no idea these existed! I want to try the Poizon Zinfandel. I love all of these 🙂 I had Zombie Zin a couple of years ago, and it was super good! I absolutely love these! Definitely going to be bringing a few of these with me to a Halloween party over the weekend. Maybe it will cover up my lack of a good costume haha. Cheers! Oh Sirah, how i love you so!! Some goodies to try. I mean, what is halloween without some booze, right?! Great halloween wine finds! Apthothic dark is one of my favorites too! Cindy recently posted…Gluten Free Fridays #218 Fall is Here with Great Recipes! Zombie Zin – perfect! I’m thirsty already! What a great list! I think I’d like to try some Upon a Vine. Rich berries and chocolate sweetness sounds about right to me! I love your first picture too by the way! So cool? So cute, I’m going to have to remember this for next year. This is exactly what I need! Thanks for the great ideas! I’ve had Apothic Dark! I didn’t think it was all that great though. 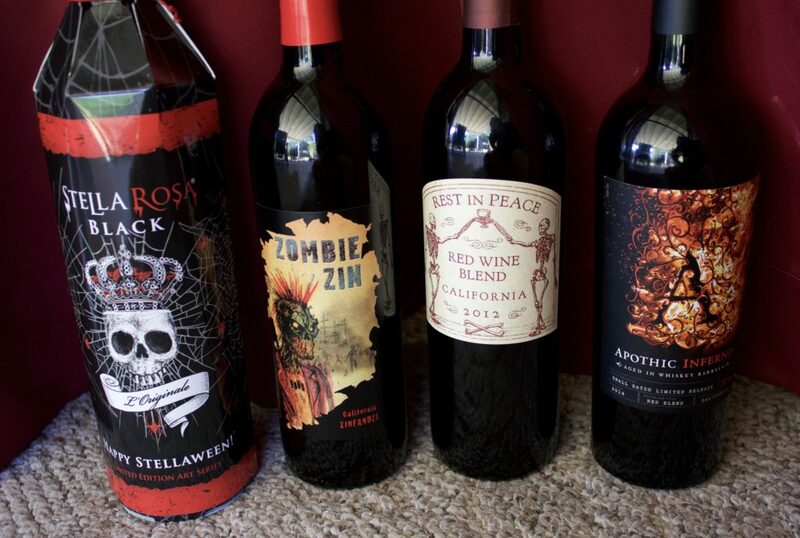 I love World Market’s Halloween wines, great for parties and such!